Rhodium is a lustrous, silver-white noble metal. It is the rarest and most valuable of the precious metals. Where Does Rhodium Come From? Most rhodium comes from South Africa, where it is extracted from platinum ores along with other precious metals such as gold, silver, palladium and platinum. 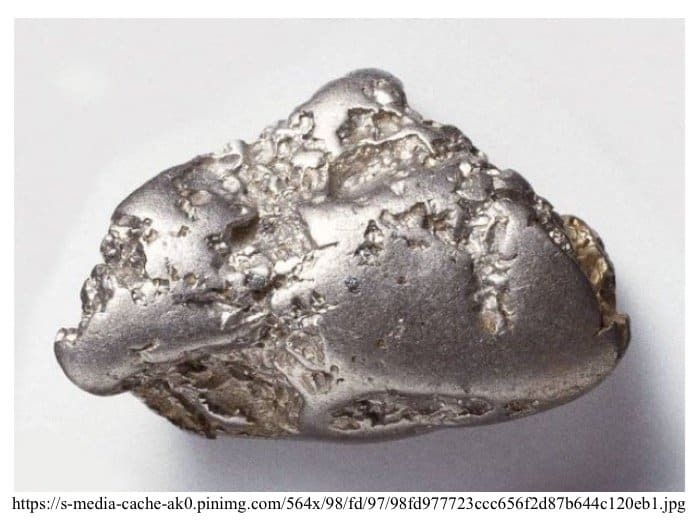 Due to its rarity, which is an estimated 0.0002 parts per million in the earths crust, rhodium is never mined for itself and is found as a bi-product of mining other precious metals. Like other noble metals such as gold and platinum, rhodium is resistant to corrosion and oxidation. 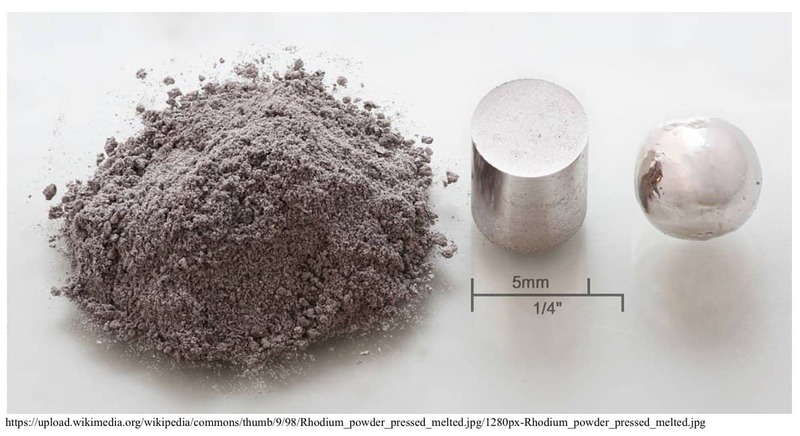 It takes a very powerful acid to dissolve rhodium, and only dissolves completely while it is in a powdered form. It’s a relatively hard metal, rating a 6.0 on Mohs hardness scale, which is just one point below that of quartz. It also has a very high melting point at 1964 °C. Because of rhodium’s high melting point, hardness, and brittleness (as well as it’s rarity), it is almost never used exclusively to make jewelry. However, rhodium’s mirror-like brilliance is more spectacular than almost any other metal, so it makes a fantastic plating. What Is Rhodium Plating And How Is It Used? Rhodium plating is the process of applying a very thin layer of rhodium to materials. This thin layer provides durable protection along with exceptional brightness. A dazzling coat of rhodium on a ring often makes diamonds look bigger and better due to the highly reflective surface. Most white gold jewelry nowadays is rhodium-coated because of the beautiful lustre it provides. However, because it is just a plating, it will eventually wear off and need to be re-plated. How long the plating lasts depends on a few factors. First of all, it depends on how much wear the piece of jewelry receives. Rings suffer a great deal of wear, whereas earrings or a brooch typically experiences much less. Secondly, the quality and thickness of the plating is important. A specialty plating shop will typically provide a far longer-lasting layer than the backroom of a disreputable jewelry store. Finally, the fading of the coating can be more apparent if the underlying material is a vastly different color. High-quality white gold with a high-quality rhodium plate will last a long time because the thinning of the plating won’t be immediately apparent. A slightly off-color ring plated in rhodium will show wear more quickly. With all this in mind, the rhodium plating on your ring should definitely last longer than a year, with 2-3 years to be expected. Despite rhodium being sometimes 1000x more valuable than gold, plating a ring is a relatively inexpensive process. It can vary depending on the quality of the rhodium, the size of the piece, and other factors, but is typically around $60 – $120. Even being so affordable, it is not advised that you plate your ring annually! The process involves stripping off the old plate and removing scratches, which can wear down a ring prematurely. Rhodium plated jewelry is often some of the brightest and most stunning available. The shine it provides, as well as the value of the metal itself, appeals to many people, but by being a plating, it can wear down and expose the metal underneath. Fortunately, as we mentioned, the plating process is relatively inexpensive and only needs to be done every few years. Some people even find the exposure of white gold through a rhodium plate to be quite attractive!